(PRLEAP.COM) March 23, 2013 - Lori March Scourby, wife of Alexander Scourby, famed actor and narrator of the Audio Bible, died peacefully in her sleep on March 19, 2013 at the age of 90. 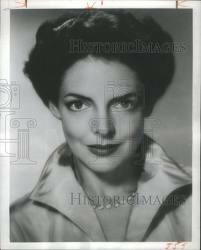 Lori March Scourby was born in Hollywood, California on March 6, 1923 to actor Theodore Von Eltz and screen writer Peggy Prior, and attended Beverly Hills High School. Lori moved to New York in 1939 to study acting and got her first role in 1940, working under the pseudonym "Lori March". She went on to become a well known actress on television, Broadway and film working on serials, such as "The Brighter Day" and the Secret Storm. Lori was 5 feet 5, had a slight frame and weighed 110 pounds, with sparkling brown eyes and dark brown hair. She had a quiet demeanor and always was elegantly dressed, except when she was at home, then her favorite attire were blue jeans. She was one of those people you never would forget once you met her. While living in New York she met Alexander Scourby, an already established actor, and they married May 12, 1943. Their only child, Alexandra known as Lexi, was born on March 27, 1944. Lori gave up acting to become a full time mother and didn't resume her acting career until Lexi was four years old. Lori was a dedicated actress who always knew her lines and never late for an appointment. During the height of her career she was called, "The First Lady of Daytime Television". She received a tremendous amount of fan mail and diligently worked to answer them all by hand. No Facebook, twitter or smart phones in the 1950's. Lori and Alexander had a home in Connecticut and an apartment in New York. Lori's passion was gardening and she would spend long hours tending the vegetables and the fruit trees. Then in the fall she and Alex would "can" as much as they could for the winter months. Alexander Scourby's passion was his narration of books and he spent his extra time recording books at the recording studios of the American Foundation for the Blind (AFB). During his career he ended up recording over 500 books for the AFB. He was so good at his craft that the Chicago Tribune wrote that he had "the greatest voice ever recorded and was the world's best audio book narrator bar none". His most famous recorded book was the King James Bible recorded in 1950's and it's still a best seller today. Lori and Alexander Scourby had an idyllic life where they spent their time enjoying their acting careers, their homes in New York and Connecticut and often attending Broadway shows as well as entertaining in their home. But most importantly they enjoyed each other and it was one of those special relationships where love for each other was the foundation stone in their lives. Lori once said the following with smiling eyes, "We have a good life, have love in our lives, good friends and similar careers that we love. We have a full balanced life and are never bored. We are very fortunate". Alexander Scourby died in 1985 at age 71. This reporter was privileged to know both Lori and Alexander and this is written with a deep sense of loss for two of the finest people one could ever meet. One can only hope they are both now re-united in eternity and cradled in the hands of a loving God.